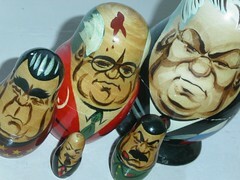 Here is another set of matryoshka dolls that we love – The Former Soviet Leaders. In size order we have: Yeltsin, Gorbachev, Brezhnev, Stalin *and *Lenin. Quite clearly there were many more leaders but these are the most recongnisable, I suppose for the tourist market. The set was a gift from a friend of my husband’s, who was doing a University language exchange to St. Petersburg in the early 90’s. They’re a miserable looking bunch but I like them anyway!